Looking for mortgages for a second home, investment, or vacation home? Second homes can be an option for an investment and potentially yield a return by appreciating and be a write off when it comes to taxes. When the property produces rental income, a vacation home mortgage, investment mortgage, and second home mortgage are underwritten differently. Lender’s pricing for an interest rate and down payment vary when it comes to a second home loan, an investment property, and mixed use. Having multiple FHA loans or VA loans can be more difficult than getting a conventional second home or investment property. 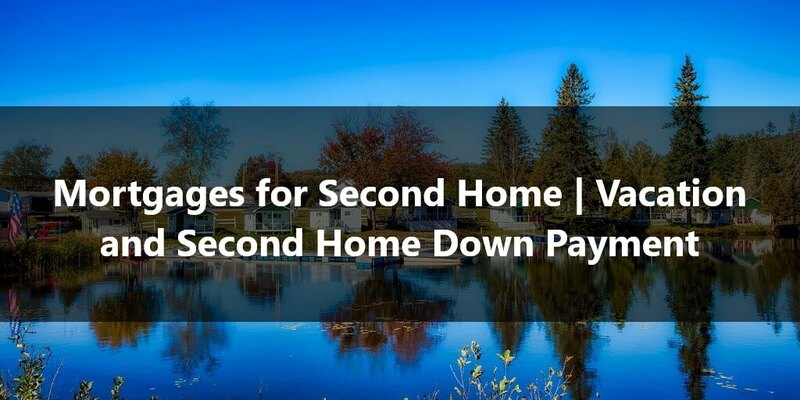 There is a difference between mortgages for second homes and vacation homes. You must occupy the property for a portion of the year. The home can only be one-unit dwelling. The property must be suitable for year round occupancy. The property cannot be a rental property nor have any type of timeshare arrangements. Agreements cannot be given to a management firm to control the occupancy of the property. A vacation home mortgage is an investment home mortgage if the property is going to generate rental income. Lenders consider a vacation property as an investment property if the borrower’s intentions are to rent the home. The second home down payment is 10% for a 1 unit – maximum loan-to-value is 90%. Pricing for mortgage interest rates usually improve upon putting more of a down payment on a home – pricing will improve at 15%, 20%, 25%… etc. For a second home, you can refinance with cash out up to 75% loan-to-value. 15% for 1 unit – maximum loan-to-value is 85%. 25% for 2-4 units – maximum loan to value is 75% for a multi-unit investment property. When concerned about an interest rate, pricing will vary depending on the down payment or loan-to-value ratio. For example, if a borrower was to put 20% down for a 1 unit, instead of 15% down, this will avoid mortgage insurance or having to choose lender paid mortgage insurance (LPMI). Pricing usually improves at 25% down and 30% down payment. Can do a limited cash-out refinance up to 75% loan-to-value for 1-4 units. Can cash out up to 75% for a 1 unit investment property with the traditional Fannie Mae and Freddie Mac options. There are options to cash out higher through portfolio wholesale lending and avoid having to do a full doc loan. Why can a borrower not say that an investment property or vacation home is a second home? Pricing can often be more favorable for a second home than an investment property. It is important to understand the interest rate that is associated with the type of loan you are applying for. A lender will often know during the underwriting process and find out if a second home is really a second home or investment property – there are occupancy questions that will be asked. Underwriters first look at where the primary residence and the subject property are located. Underwriters are trained to look in depth into a mortgage application and can tell if a property is a second home or investment property. Often if questioned, sufficient evidence will be needed to clear any condition added to the loan commitment/conditional approval. There are loan programs that have mixed use like condotels and non-warrantable condominiums.